Following along on my Greek-themed recipes, this is a Greek-style Lasagna. It's a bit like pastitsio, a pasta, lamb and bechamel layered dish, but for this version, I didn't use any meat and used a ricotta cheese mixture instead of bechamel. Delicious! 1. Preheat the oven to 350 degrees. Bring a large pot of salted water to a boil. In a large saucepan, heat the olive oil until shimmering. Add the onion, oregano, cinnamon, cloves and a generous pinch each of salt and pepper. Cook over high heat, stirring frequently, until liquid has evaporated, about 8 minutes. Add the marinara sauce and bring to a boil. Boil over high heat, stirring occasionally, until the sauce has reduced slightly, about 5 minutes. 2. Cook the pasta until barely al dente; drain and return to the pot. Meanwhile, in a blender, blend 2 cups of the ricotta with the yolks, nutmeg and 1/2 cup of the Parmigiano-Reggiano until smooth. Season with salt and pepper. Pulse in the remaining ricotta. 3. Add the sauce to the pasta and toss. Transfer the pasta to a 9-by-13-inch baking dish. Pour the ricotta mixture on top and sprinkle with the remaining 1/4 cup of Parmigiano-Reggiano. Bake in the center of the oven for about 20 minutes, until heated through. Turn the broiler on and broil until the top is golden brown. Let stand for a few minutes before serving. Really a very simple and tasty dish. If you'd like a meaty dish, add 2 pounds of ground lamb to step one. That makes a phenomenal sauce and adds a wonderful depth of flavor to your meal. 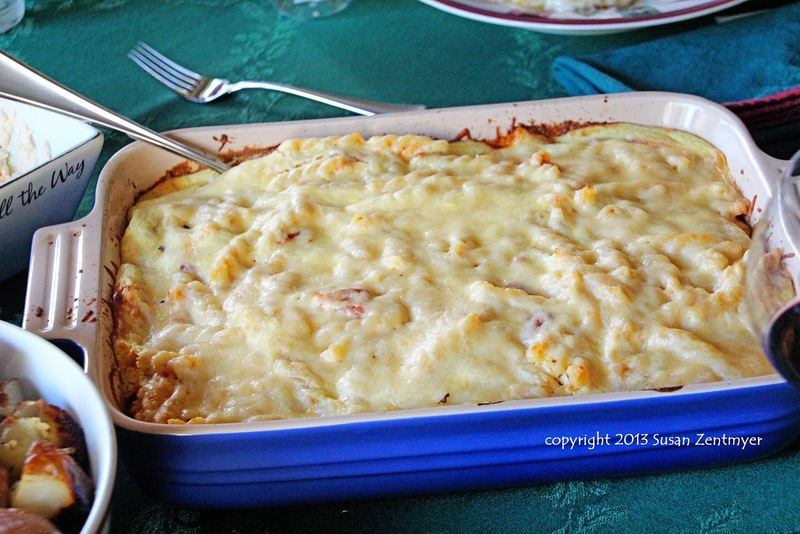 Would you try this sort of blend of Greek Pastitsio and Italian Lasagna?